Abstract: Alzheimer’s disease (AD) is the most common form of dementia, with no effective preventative strategies or treatments. A major obstacle when designing therapeutics to treat AD is the lack of predictive animal models in preclinical testing trials. One reason for this may be that existing models are based on familial mutations, which accounts for only 2-5% of all cases, while most AD cases are non-familial late-onset AD (LOAD). 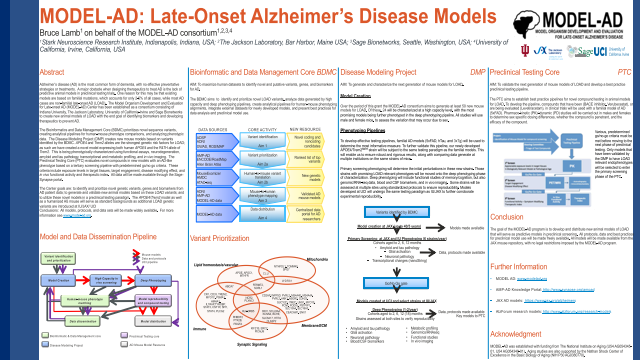 The Model Organism Development and Evaluation for Late-onset AD (MODEL-AD) Center has been established as a consortium consisting of Indiana University, The Jackson Laboratory, University of California-Irvine and Sage Bionetworks to create new animal models of LOAD with the end goal of identifying biomarkers and developing therapeutics to prevent AD.